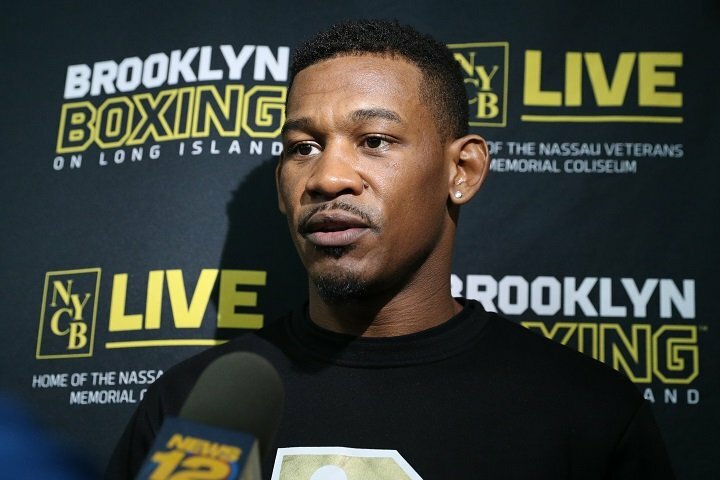 By Dan Ambrose: Former middleweight champion Danny Jacobs (32-2, 29 KOs) sees himself as having far too many advantages for his unbeaten opponent Luis Arias (18-0, 9 KOs) when these to face each other in a little over 2 weeks from now on November 11 on HBO Boxing at the Nassau Coliseum in Uniondale, New York. Arias, 27, looks like a pretty good fighter. He might surprise a lot of people on November 11 and pull off a major upset against Jacobs; although I tend to doubt that he’ll be able to beat a fighter like Jacobs. That’s a big ask for someone with so little experience against top level opposition at middleweight. “I don’t see it as a stay busy fight,” said Jacobs to ES News Reporting about hi fight against Arias. “I know I have the attributes, and the physical advantages. With this fight, my length, my speed, my power and everything I possess inside the ring. This guy is looking to have an out of body experience. He’s looking to be a super human that night. I don’t think he has the experience. I don’t think he has the mentality to be in there. When you go in there, it’s different. You can brag, you can talk and you can try and hype yourself up, but it’ll be a different thing when you get inside the ring and you get hit,” said Jacobs. Jacobs being with HBO might help him get Canelo and Golovkin, but not necessarily so. It’s going to depend a lot on who Jacobs fights, and how good he looks in winning his fights. Before Jacobs fought Golovkin, he was doing nothing to increase his popularity by fighting fighters like Sergio Mora and Caleb Truax, Jacobs was spinning his wheels with his career and not going anywhere. Arias is about as well-known to the casual boxing fans as Caleb Truax. Obviously, Jacobs is fighting Arias rather than a dangerous middleweight like Jermall Charlo because his now promoter Eddie Hearn believes he can beat this guy. But Jacobs isn’t going to build his popularity if all he’s going to do is fight guys that the casual fans aren’t familiar with. Jacobs is going to need to step it up and take some risks if he wants to create pressure for Golovkin and Canelo to fight him. Right now, Jacobs isn’t doing anything to make either of them want to fight him. “I like everybody, and I talked to HBO and told my promoter that I want them all,” said Jacobs about him wanting to fight Saul Canelo Alvarez and Gennady Golovkin. “That’s what they’re fishing for, and that’s what they’re looking for. I think it’s much easier now we’re on the same network. I think it’ll be much easier because we’re on the same team. But it’s all based on whether these guys want to step inside the ring, because you can’t force these guys to fight,” said Jacobs. Jacobs is still totally committed to fighting a rematch with Gennady “GGG” Golovkin, who he lost to earlier this year by a 12 round unanimous decision. Even now, Jacobs still denies that he deserved a win, as he thinks he did enough to deserve he decision in that fight. Jacobs says he beat Golovkin, and that he wasn’t wowed by his power. Jacobs says he’s been hit harder before by light heavyweight Marcus Browne. However, that’s a fighter from the 175 lb. division, so it’s unclear why Golovkin is being rated with a fighter from two divisions above his own at middleweight. “It wasn’t a true knockdown, but I’m not going to dispute it, because it was a punch that touched me,” said Jacobs to ES News Reporting about his loss to Golovkin. “However, I slipped and I went down, so I didn’t dispute it. Even with the referee, I didn’t dispute it. I didn’t even wipe my gloves on the referee. I just went directly to Triple G, because I was ready for war. The guy didn’t hurt me. I went forward. What fighter goes to the fighter that knocked him down? So I wasn’t hurt. And everybody is talking about the weight,” said Jacobs. It did look like Jacobs was knocked down while he was off balance, but that’s now it goes in boxing. That still doesn’t explain why Jacobs was moving so much in the first 6 rounds of the fight, and not standing his ground to fight GGG. That’s where Jacobs lost the fight. Jacobs skipped the International Boxing Federation’s fight day weight check so that he could use the time to rehydrate as much as possible for the fight, and he looked like he was in the mid-180s by the time he stepped foot inside the ring. Even with Jacobs’ big size advantage, he wouldn’t stand and fight Golovkin until later in the ring. In the final 3 rounds, Jacobs was still moving a lot, and failing to fight like a guy that was trying to unseat a 3 belt champion in GGG. The knockdown was a flash knockdown, but there’s no mistaking that Jacobs fought in a timid manner against Golovkin for the first 6 rounds. It was impossible to give Jacobs any of the first 6 rounds. By the time round 7 started, Jacobs needed a knockdown and he needed to win the last half of the fight to get a draw. That didn’t happen for Jacobs, so he lost. It’s too bad that Jacobs can’t admit that he lost the fight, because he seems really bitter about the fight. It would be better if Jacobs gave Golovkin credit for beating him so that he doesn’t come across as a sore loser. “It wasn’t what I thought it was going to be,” said Jacobs about Golovkin’s punching power. “The way people make it out to be. It wasn’t [powerful as I though], but he’s a world class fighter, and he’s a true champion. He came to fight. I felt like I won the fight, but that’s just me. The [judges] had it the other way. All I can do is continue to push and hopefully get a rematch. I just know that it wasn’t the hardest I’ve ever been hit,” said Jacobs. I don’t think it really matters whether Jacobs thinks Golovkin wasn’t a hard puncher or not. That’s not how Golovkin was fighting Jacobs. Golovkin was using his power jab to nail Jacobs and keep him bottled up on the outside. Golovkin didn’t throw a lot of big power shots in the fight. Most of what Golovkin was doing was using his boxing, and jabbing Jacobs hard in the face. In looking at Jacobs’ face after the fight, he looked beaten and swollen. Golovkin might not hit hard in Jacobs’ view, but he sure did do a good job of puffing up his face with the shots he did land. Jacobs’ face didn’t get swollen up on its own. Golovkin did that to him, so he must hit hard enough to have rearranged his features. “I will see what guys step up to the plate in 2018,” said Jacobs. I don’t think Jacobs is going to get Saul Canelo Alvarez or Golovkin in 2018. If Jacobs wants one of those fighters, he’s probably going to need to wait until 2019 at the very least. Golovkin will either be fighting Canelo in a rematch in May of next year or he’ll be fighting WBA World middleweight champion Ryota Murata. If the rematch against Canelo can get made, the fight will take place in September. That’ll be Golovkin’s second fight in 2018. I don’t think Golovkin will make a quick turnaround to fight in December after fighting Canelo in September. Jacobs’ best shot a fighting Golovkin and Canelo is to wait until 2019. Jacobs, 30, can increase his chances of fighting GGG and Canelo again if he can create some buzz with his own boxing career by fighting some good middleweights like Jermall Charlo, David Lemieux, Demetrius Andrade and Sergey Derevyanchenko. Those are 4 very good fighters. Jacobs can get the boxing fans interested in watching him fight GGG again if he can beat guys like them. Luis Arias is a decent fighter, but he’s not on the level of the guys above. I don’t know who Jacobs’ new promoter Eddie Hearn will be matching him against in his next fight if he can get past Arias on November 11. Hopefully, Jacobs isn’t put back in with the likes of Sergio Mora and Caleb Truax, because those fights were a waste of time for him.